It's a gloomy shot, anyone would think I was up super early, but it's not. Well it is, but today is a doing day for me, so I have to get up at the time that most working people do! The gloom is somewhat cheered by the colourful presents. I'm way ahead of myself here, but decided whilst my desk was clear enough, to spread out tissue paper and wrap the gifts I've got for the Coven - part of a challenge we connect to the first of our bi-annual scrapbooking weekends. Meanwhile, I've changed the stamp set that was on the iPad stand. Only because Kimbo asked what I was planning for it because it had been there for so long. So I dusted it and put it away. No plan yet, Kim, but you never know, now you've made me see it again....! Show and tell then, your creativity must surely extend beyond a bit of gift wrapping! Like a lorra people who do papercrafts, I strive to keep my recyclable rubbish and rubbish rubbish apart. I don't have two bins, so I tend to keep the non recyclable on the desk top and move it when I've finished. (A rare thing, considering my inability to really tidy up). 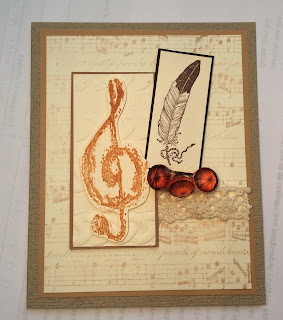 Anyway, this week I am conducting a workshop and we're going to make, among others, this card. As you can see, it involves die cutting. I decided to get ahead of the game and cut the turquoise ones as part of the kit. Because it's a fancy shmancy die and is fiddly and is difficult to release from the die once cut and because it's prone to tear and because it needs wax paper and because it just saves time. I mean, who wants to pay for a workshop that involves wasting precious time wrestling with a basic design feature. Not me. I'm my own benchmark. So I set myself up. And couldn't find the die. Seriously - a new die, and already missing. I looked everywhere. And concluded that somehow, I must have thrown it away. So now you see why I was grateful that snotty tissues, drinks cans, apple cores, banana skins and such are thrown away elsewhere. The only rubbish in my workroom bin is paper, card and plastic wrappers. Or that's the plan. Metal dies are not a part of that plan. So I went through it. And I couldn't find the die. So I got another bin liner and emptied everything, one piece at a time, from this one to the other. Still no die, and only about 20 minutes wasted so far. I really was at the point of tantrum; I like this die, I do not like it enough to buy it again, and now I actually neeeeeeeed it. So I tried my mother's trick. Calm down and look in all the places it shouldn't be. It wasn't muddled in the clear stamp drawers. It wasn't trapped under the cutter (a quite well known hidey hole, actually) and it wasn't for the 4th time of checking, in the folder where it should have been. But I did find it. It was in the folder where it shouldn't have been. The one allocated to Christmas themed dies. Yeah, I felt foolish. Still do. And yeah, both files are the same to look at. And no, I haven't labelled them. I assumed that the bulging, over full non-Christmas themed file would be all the clue I'd ever need. I must have been distracted.it appears that even when I tidy up, I'm untidy. Glad to be in possession of that fab die though! 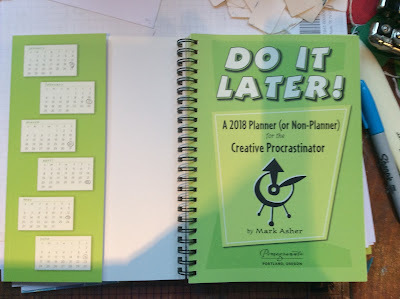 Well, I know we all say it, but last week really got away from me, I haven't finished it yet! Anyway, here's the desk...just finishing a fun card to add to my workshop samples for next week. I took the photo on Tuesday afternoon. The only change is that the card is missing, and it's as dark as a dark thing outside right now! There's my box of gems. I use them, but I kind of like to buy them too, so it's fair to say that there is always a box full. Three pairs of scissors - not bad in terms of restraint! See at far left there's a single leaf on a white sheet..I only noticed it on the photo, its a stamped coloured and cut out leaf from I don't know when...it's just magically appeared after being lost. I expect at the time I cursed the losing of it and had to stamp and colour a replacement for it! I'm tidying later, in anticipation of spending some time getting to know the Scan&Cut. Time is against me, but my conscience tells me to get on with it! Show and share then, if you will...put WOYWW in your post title and link it here. Straight into it today dear deskers; no amount of explanation will make it tidy! I took the photo on Tuesday late afternoon, as I was meant to be tidying up but I was shocked into inaction by the snowing weather. Argh. You see the Dreamcatcher on the desk, there's a stamped image and a die from Sheena's latest collection. It's nice. They may look like Wink of Stella, but the pens are actually called Moon Sparkles by Dawn Bibby. The labels peel off and the pen is printed with the Wink of Stella brand name. Make of that what you will! I've been trying to come up with some male style cards. I may not have succeeded, but I must say that I've had a fun couple of hours at my desk trying! Nothing particularly new to report on..I'm going back to the desk now to see what exactly is sticking out from under the cutter at far right. Something with a pair of boots on it....no idea what! Share your space please..we (I) need to see! Or, as you can probably tell from the photo - the plastic board I use to protect my pen holders from the sunshine. It's slightly unusual because I bought a metric version. I use metric at work and cannot fathom some of the imperial measurements. I'm between Metric and Imperial in terms of age, and really learned the Metric system once and for all when Miss Dunnit went to school. However, it doesn't mean that I use my Metric Scor-Pal any more. Or at all. I can't remember the last time I reached for it. I did a bit of paper engineering with it originally, and I'm pretty sure I used it in a couple of workshops so that people could do the old 'try before you buy' thing. I need to apply the wardrobe principle to these items...if I haven't used it for a year, I clearly don't need it! This feels like a real confession. Anyone care to join me in this occasional series?! Lovely Darnell has launched the 'Twofer Challenge' and I encourage you to do what I did. Go over for a browse and be so totally inspired that you'll be moved to take part. 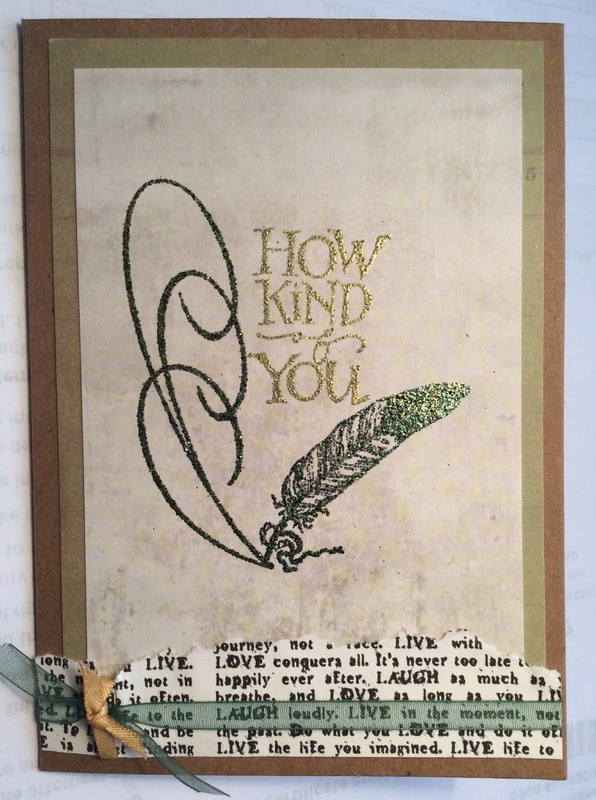 Not only that, and disregarding the utter mess that I made on my desk, I used scraps and two stamps that I hadn't yet used. This NMBUS (Never Before Used Schtuff) is part of Darnell's life mission as a crafter, to get the NMBUS off the shelves and strutting its stuff! 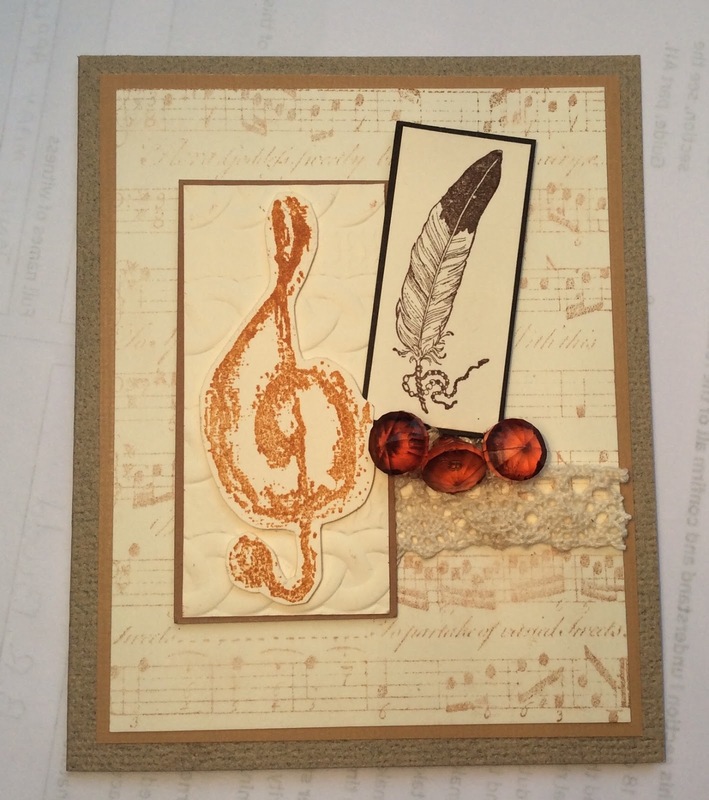 The theme of the challenge is to make two different occasion cards featuring the same themed stamp/image/die cut. This month the theme is Feathers. PSX (!) and Rubber Stampede (!) and Art Impressions stamps. The feather is part of my inheritance from Mary, and is NMBUS. Now I've been forced to use it, I like it. The inks are Adirondacks, also from Mary. Everything else came out of the scrap box, which is a bit of a result, to be honest! PSX, Hobby Art and Wordsworth stamps. I love the Hobby Art scroll so it was a no brainer to put it with the quill and add a bit of beautiful lettering. 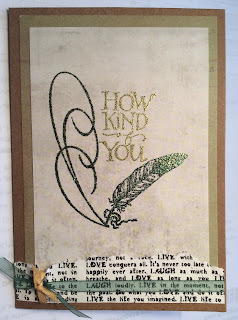 Again, all on scraps and I used two new embossing powders. Don't expect this to last, but for now, I feel smug enough to enter the challenge! Well hello 449! Look at me, I've actually got Work In Progress on my desk! I can hardly believe it myself! Of course, you have to studiously ignore Mr Dunnit's photo-bomb. He wishes y'all Happy New Year with his knobbly fingers gesture. I think. Funny how after 438 weeks he feels the need to appear! Far left you can see the scratch paper and a piece of card with sponged ink all over it. The image on the card by my glasses is a cactus and I'd just finished trimming it on that very trimmer when I finished last night. It was a good place to stop because I'm experiencing a colour dilemma now! I thought I'd have a go at a card or two to appeal to men. We'll see. At right you can see another bottle of spray ink that fails to spray anymore. And the trusty anti-static bag. I find this particularly useful for card that's been sitting about in the old scraps box, I guess it's just hoovering up environmental static! So I have nothing solid to show, but it's a positive outlook! What are you up to? Show and tell please. Link your WOYWW blog post here and we'll trot round. I bought this in Wales, when we stopped for lunch and a leg stretch on the way to Llandudno for the Crop. Frankly, it's a miracle that I've remembered where I put it, after all, that was at the end of September! 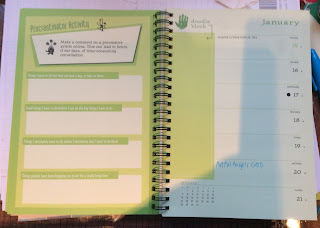 So that's a happy memory every time I need to use a diary. Another is that Jan said she'd have bought it for me as a Christmas present if I hadn't seen it and snatched it up. That' s another good thing really, because I would have unwrapped it and felt somehow that my secret was out. 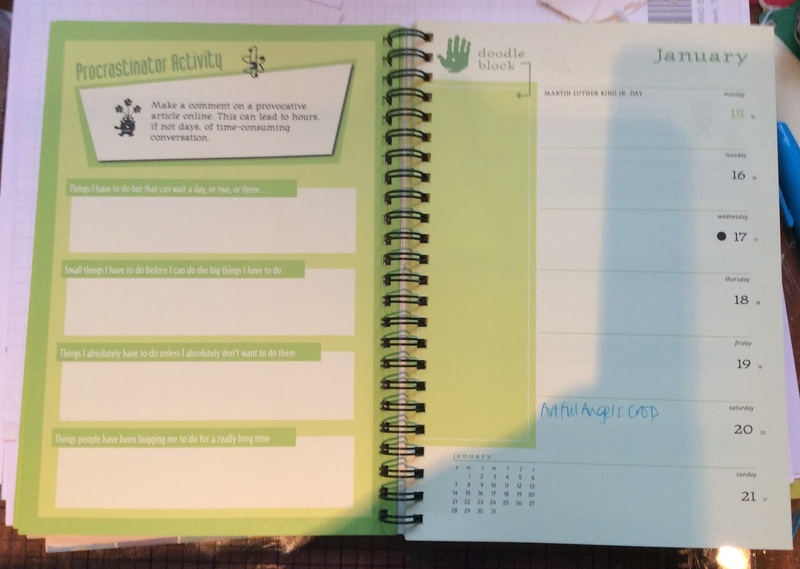 It's a good mix of useful tool and fun and gentle prompt; nice and tongue in cheek. We need a desk diary; two diaries on phones don't work, as we've found to our cost. I'm an Apple gal he's a Windows boy and the two do not, will not, cannot sync. Or is that just us? either way, annoying. I often wonder if we'll ever be effective users of all the technology we are owners of. And I scare myself just thinking about all the routes and commands I'd have to memorise, so I don't try....that is a sign of something, right? I like to think it's merely procrastination. It doesn't look like an empty desk, but it's as good as! There's the cutting mats and quick start manuals etc that came with the ScanNCut. I've registered it, downloaded the software and...that's it. Too many visitors or visiting last week. I need a few hours to myself and some quiet to absorb all of the instructions and try the thing out! There's a greeting card that Jan gave me with a haul of pressies. I'm not sure how clear it is - it says 'nothing beats the satisfaction of crossing things off a list'. This is an unsubtle poke at my propensity for list making. She's had a fairly unsubtle gift from me too, so we're all good! 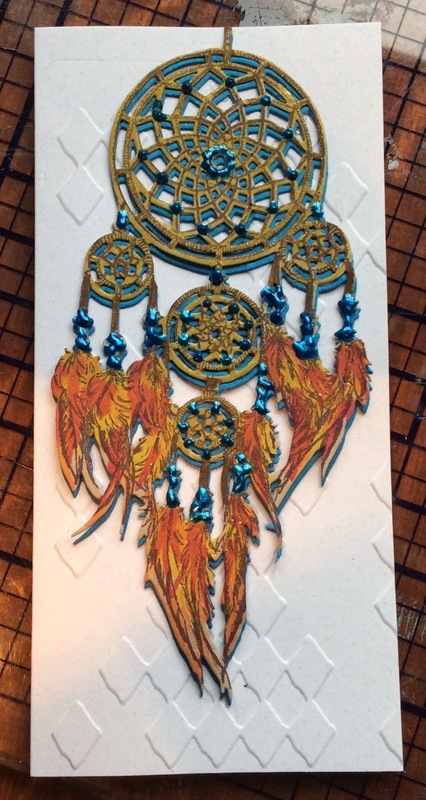 There's also a new stamp and die from Sheena's collection - it's a dream catcher. I don't know what I'm planning for it, but I loved it, so I had to have it. Simple isn't it really. So much easier than making up excuses! Heat gun, buried in the ribbon overflow box...not even plugged back into it's home socket after helping with the freezer, so you can really tell how little I've done over the holiday! Show and tell then, are you all tidied and sparkly clean for the new year, or like me, just picking up where you left off? Anyone making next years Christmas cards I wonder?! Please join us, put WOYWW in your post title and link it here. Fab. I like routine and continuity. So it happened again. In the tick of a clock, the year changed while I had my back turned. I was erm, asleep. I know there were fireworks locally because someone other than me heard them. I had had a couple of ridiculously generous celebratory drinks earlier and sleep was easy to gain. And I admit, hard to shake off this morning. A box of Christmas cards ready to ship. The ones I made for the charity...remember? I barely do. We've had the laziest Christmas week ever, I think. Seriously, apart from changing bedding between visitors I don't think I've done anything of any significance! We've woven a rich path between friends and relatives for visits that involve food and drink. I'll go anywhere for fruitcake. I have expressed excitement over a Wedding invitation as 'Oh good, a fruit cake day'. I'm not great at looking back, but I do want to warn you. 2017 was a bit of a recovery year for me - adjusting and shrugging on my new normal. One of the things I neglected, in my opinion, was my blog. So here's the warning. That will change this year. I hope the blog won't change, but the frequency of posting will. Of course, none of this will mean anything if this is your first reading here. And none of it, in the grand scheme of things, is very impressive! It was a pleasure to hear the BBC announcing New Year as it arrived across various continents. Because I know people on most of them now, people I've never met, thanks to blogging. I wish you a happy and healthy 2018. If you've got those two, everything else is easier. And I hope you'll drop in here every now and then to read the ramblings of a friend you may not have met. Yet.